In this blog I will introduce the Correspondence Analysis – a visualisation technique for categorical data. All the code has been compiled in my github repository. Correspondence Analysis (CA) has been around for a very long time. It was first developed in the 1930-ies, and made popular by M. Greenacre in the 1980-ies. It is an established statistical analysis techniques with dedicated annual symposiums and sufficient amount of literature covering theory and applications. Inspite of its popularity, I have only recently discovered it, and thought that it is worthwhile to document the fundamentals on my blog. What Exactly is Correspondence Analysis? CA is a visualisation technique that can be applied to categorical data for data exploration. Unlike numerical data, categorical features are harder to analyse and visualise. CA uses a matrix decomposition method, namely SVD, and thus you may see CA being likened to the Principle Components Analysis (PCA). However, CA is not, strictly speaking, a PCA for categorical data, mostly because the primary objective of CA is to provide a visualisation of associations among categorical features. Can you spot any differences in the use of letters by author from sampleCrosstab? It is almost impossible to do so by just looking at it. Instead, CA resorts to the statistic. In the above code correspondenceMatrix holds normalised frequencies. The statistic is 448.50, which is very unlikely to be observed under the null hypothesis (that the letter frequencies follow the same distribution). Having established this, we can continue with the CA as we now know that it should be able to show us some meaningful associations. where and are the left singular vectors matrix and singular values on the diagonal matrix from SVD. The is diagonal matrix made of the reciprocals of the square roots of the row totals. 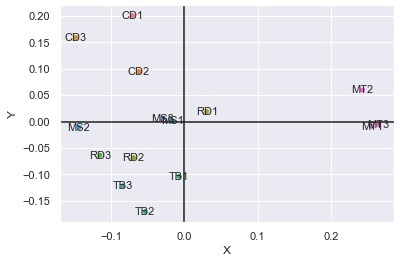 The plot clearly shows letters associations by author. Mark Twain and Charles Darwin’s samples stand out as significantly different from the rest. Source and Reference:  P.Yelland, An Introduction to Correspondence Analysis. The Mathematica Journal 12, 2010 Wolfram Media, Inc. This is my first post in 2018. 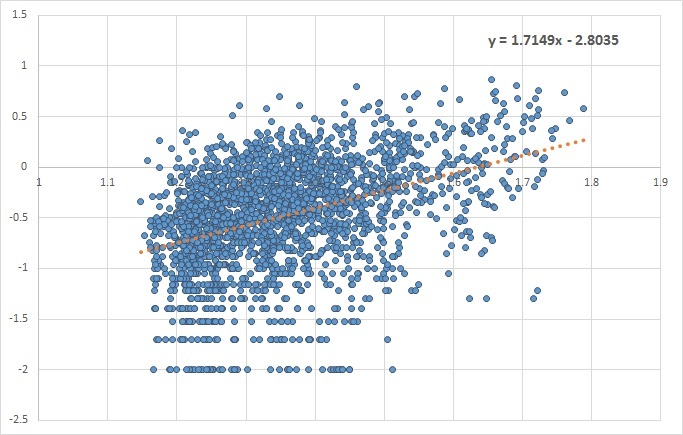 In this post I will share with you a very simple way of performing inference using Approximate Bayesian Computation (ABC) – not to be confused with Approximate Bootstrap Confidence interval, which is also “ABC”. Let’s say we have observed some data, and are interested to test if there was a change in behaviour in whatever generated the data. For example, we could be monitoring the total amount that is spent/transferred from some account, and we would like to see if there was a shift in how much is being spent/transferred. Figure below shows what the data could look like. After we have eye-balled the graph, we think that all observations after item 43 belong to the changed behaviour (cutoff=43), and we separate the two by colour. The first question that we can ask is about the means of the blue and the red regions: are they the same? 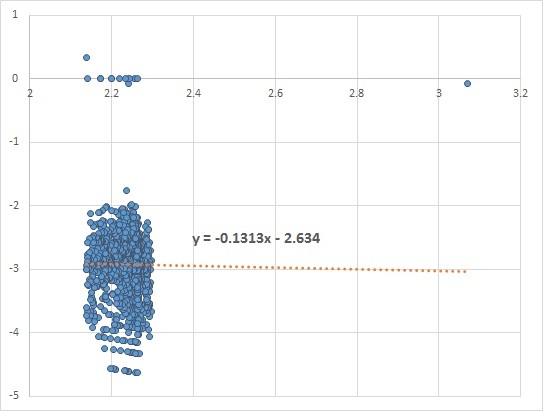 In the figure above I am showing the mean and standard deviations for the two sets. We can run a basic bootstrap with replacement to check if the difference in the means is possibly accidental. 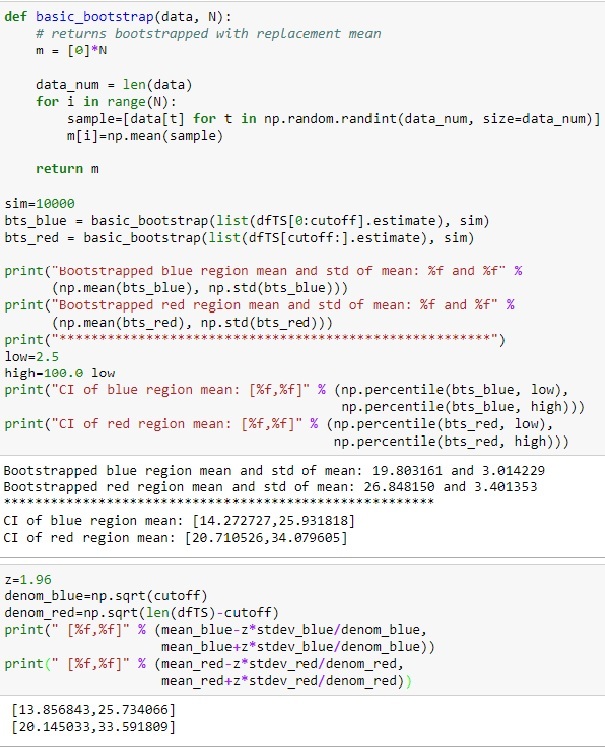 In the figure above basic_bootstrap generates a distribution of means of randomly sampled sets. The confidence interval is first computed as non-parametric. But a quick comparison with 95th CI using normal standard scores shows that the simulated and the non-simulated confidence intervals around the means are very close. Most importantly, the confidence intervals for the blue and red region means overlap, and thus we would have to accept the null hypothesis that the population means are the same and differences seen here are accidental. Approximate Bayesian Computation (ABC) relates to probabilistic programming methods and allows us to quantify uncertainty more exactly than a simple CI. A pretty good summary of ABC can be found on Wikipedia. If we are monitoring transactions occurring over time, we may be interested in generating alerts when an amount is above a threshold (for example, your bank could have a monitoring system in place to safeguard you against credit card fraud). If, instead of comparing means of red and blue region, we decided to answer the question about how likely are we to see more trades above the threshold in the red vs. the blue data regions, we could use ABC. 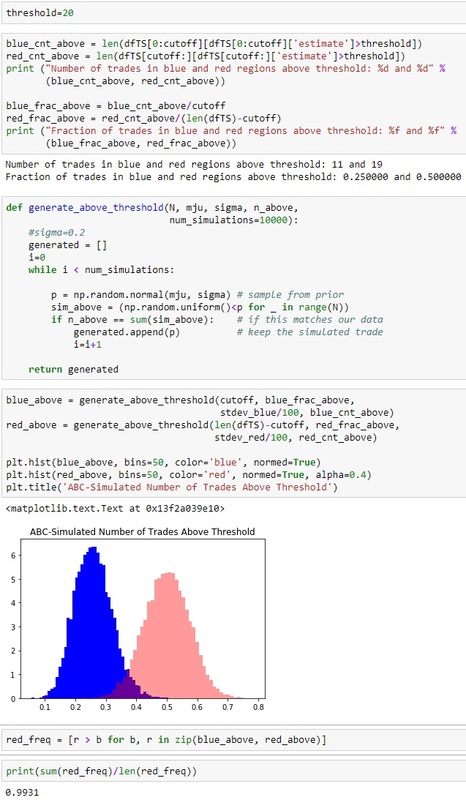 To execute an ABC test on the difference in the number of trades above a threshold in the blue and red data regions, we begin by choosing the threshold! Take a look at the CDF plot above. We see that approximately half of red data is above 20. Whereas only 25% of blue data is above 20. Let’s set our threshold at 20. The ABC is a simple simulation algorithm where we repeatedly perform sample and compare steps. What can we sample here? We will sample from two normal distributions, each with the means set to the fraction of trades above our threshold. I will use Normal distribution, but it is purely a choice of convenience. Ok, what can we compare here? 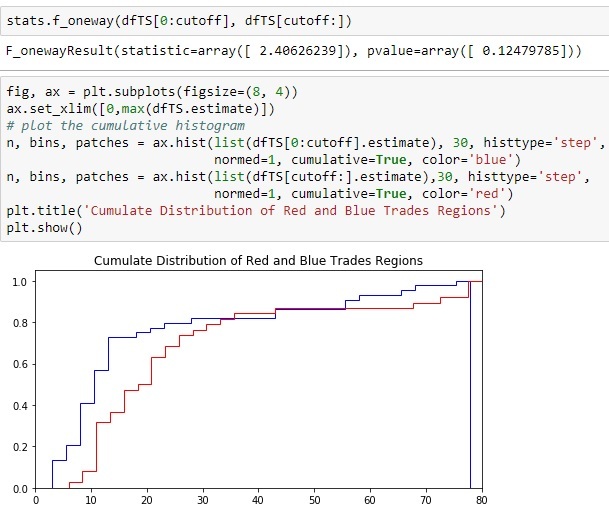 We will compare the number of trades that could have been above the threshold when the data they come from is sampled from the distributions we have chosen as our priors. And we store away the ones that are consistent with it. 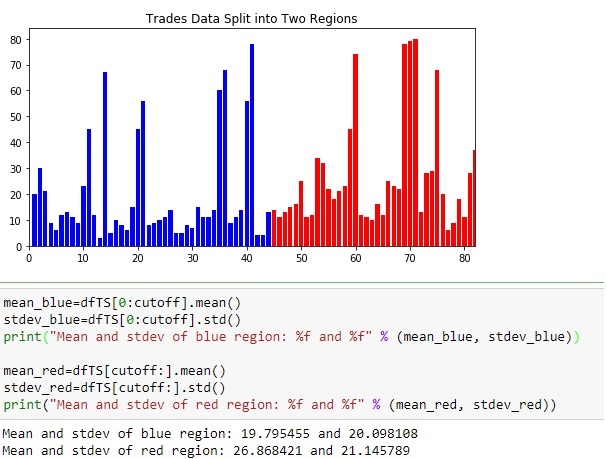 If we repeat this many times under the two parameterisations, we should build-up two distributions that can be used to answer the main question – how likely are we to obtain more trades above the chosen threshold in the red vs. the blue data sets. The code below does exactly that. We obtain a very high probability of seeing more trades above the threshold in the red vs. the blue region. The above can be shortened as . In contrast, absolute moves are defined simply as the difference between two historical price observations: . How do you know which type of return is appropriate for your data? The answer depends on the price dynamic and the simulation/analysis task at hand. Historical simulation, often used in Value-at-Risk (VaR), requires calculating PnL strip from some sensitivity and a set of historical returns. For example, a VaR model for foreign exchange options may be specified to take into account PnL impact from changes in implied volatility skew. Here, the PnL is historically simulated using sensitivities of a volatility curve or surface and historical implied volatility returns for some surface parameter, like low risk reversal. You have a choice in how to calculate the volatility returns. The right choice can be determined with a simple regression. Essentially, we need to look for evidence of dependency of price returns on price levels. In FX, liquid options on G21 currency pairs do not exhibit such dependency, while emerging market pairs do. I have not been able to locate a free source of implied FX volatility, but I have found two instruments that are good enough to demonstrate the concept. CBOE LOVOL Index is a low volatility index and can be downloaded for free from Quandl. For this example I took the close of day prices from 2012-2017. After plotting vs. we look for the value of the slope of the fitted linear line. A slope closer to zero indicates no dependency, while a positive or negative slope shows that the two variables are dependent. In the absence of dependency, absolute returns can be used, while proportional return are otherwise more appropriate. Take a look at a plot of VXMT CBOE Mid-term Volatility Index. The fitted linear line has a slope of approximately 1.7. Historical simulation of VXMT is calling for proportional rather than absolute price moves.